Leopard geckos are one of the most popular reptile pets. Not only because of their cute appearance, but also because they are pretty easy to take care of. However that does not mean that you can go and buy a Leopard gecko and everything will fall in place. You should definitely do a lot of research before getting a Leopard gecko. Unfortunately a lot of people do not do any research before getting one of these cute little geckos. You can see lots of videos on Youtube of people who got a totally wrong cage for their geckos. The only reason why those geckos survive that is, because they are so hardy. 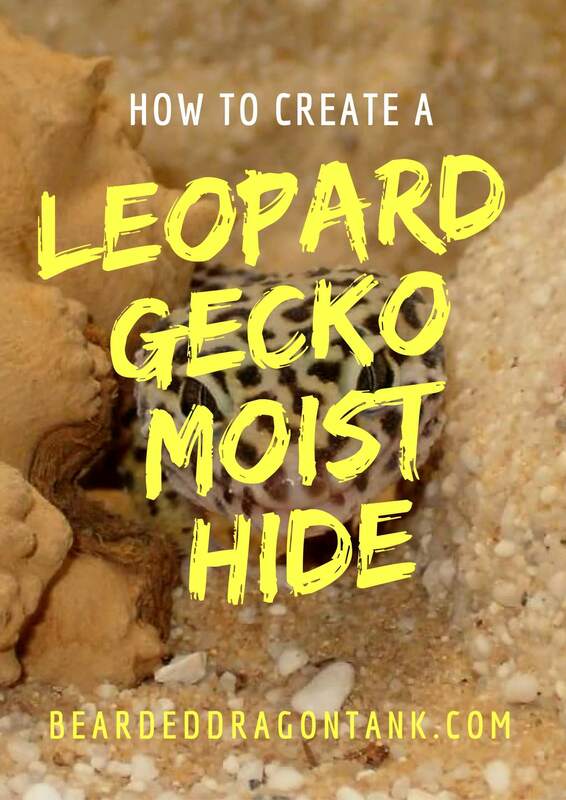 In this article I am going to show you why a Leopard gecko humid hide is so important and how to make a moist hide for a Leopard gecko. So let´s get right into things here. Why A Leopard Gecko Wet Hide? Most people think that a Leopard gecko´s natural habitat is the desert. While this is true, it does not mean that there is sand everywhere. Leopard geckos come from Asia, you can find them in Iraq, Iran, India and in a couple of more countries. Their natural habitat is the stone desert. That means that there are a lot of hiding places between the stones in their natural habitat. Further the humidity in their natural environment is around 60-65 % in winter and around 75 – 80 % in the summer. So as you can imagine, a lot of the holes they hide in during the day are pretty moist. What Is A Leopard Gecko Wet Hide For? Leopard geckos use the wet hide to regulate their temperature. The Leopard gecko moist hide box should be placed in the cooler zone of the terrarium. So do not place it right below the basking lamp. If Leopard geckos feel the need to cool down they will hide there. However there are also other things geckos use this hide for. Female Leopard geckos lay their eggs in the moist hide. It does not matter if the gecko is gravid or not. If you do not have a male gecko, a female gecko will lay unfertilized eggs and therefore it needs a moist hide with a certain substrate (I will come to this later). If you do not offer this the gecko can become egg bound and that often results in the death of the animal. Besides that a moist hide helps geckos while shedding. Creating a moist hide is actually pretty easy. However there are a couple of things you should bear in mind. Some people just use a cricket box or something similar as Leopard gecko humid hide, however that is way too small. The box should be big enough for two or three Leopard geckos, so do not get a too small one. Besides that you should not take something like a half coconut. Make sure that you get a box – It is way easier to keep the humidity high in a box. I tested some things as humid hides for my geckos. For example lunchboxes or Tupperware containers. The problem with that was that I always had to cut holes in it, which sometimes had sharp edges. Then I had to make sure that those edges would not hurt my geckos … hah it was just annoying. Half coconuts or other “hide halfs” that you can buy from a pet store did not really do the job since it was hard to keep the humidity high. This micro – climate cave on the right is absolutely perfect as humidity box for a Leopard gecko. You can easily fill it with substrate and keep the humidity high in there. On top of that you can open this little cave easily and check if your gecko is okay or if it even laid eggs. It fits perfectly into a natural habitat and you can get it in two sizes, so if you have a giant Leopard gecko breed you can use this cave as well. This cave has 4.2 out of 5 Stars on Amazon at the moment and most people use it for their Leopard geckos. So a lot of Leopard gecko owners are very happy with it, it is not just me :). There are a lot of costumer images on Amazon where you can see their Leopard geckos in this cave. Click here to see those images – simply scroll down till you see “Customer images” on the right. You definitely need substrate inside of this cave. As I told you before, female Leopard geckos lay eggs in those caves and before they do that, they dig off a little bit of substrate. Some people use kitchen roll inside a humid hide, which is a very bad idea. A lot of geckos do not lie their eggs then, which increases the risk of egg binding. The best Leopard gecko moist hide substrate is coco hummus or sphagnum moss. Those substrate are normally used for Toads. Both are very easy to keep moist. Leopard geckos really seem to like this kind of substrate, not only for egg deposition, but also for just hanging out. Many Leopard gecko owners told me that their Leopard geckos were more often in their hide after the owners started to use this substrate. Just be careful that you do not mist it too much. This kind of substrate can get mold, so let it dry out from time to time or replace it with new substrate. As you have seen, creating a Leopard gecko moist box is pretty easy. Always keep in mind that your Leopard gecko really need this hide. So I hope that this article was helpful for you. If you have any questions, simply leave a message in the comment section below. I always get back to my readers! I know from experience that it can be pretty hard to set up a cage for a reptile if you never owned a reptile before. Especially when it comes to lighting, a lot of people get very confused and I totally understand why. When I was a reptile newbie I read tons of articles on the internet on reptile terrariums and every article told me something different than the article before. I ended up buying completely wrong stuff for my reptile and as you can imagine, my pet suffered and I spent tons of money, because I had to buy a complete new setup after I failed to buy the right setup. That was a painful experience and I do not want you to make the same experience. So in this article about Leopard gecko housing I am going to show you in detail what you exactly need for an awesome Leopard gecko habitat. ​With this leopard gecko tank setup you will be ready for your cute little gecko to move in. Most people say that a 10 Gallon tank is the right Leopard Gecko tank size. The reason why they say that is because they think that it is easier then for their leopard geckos to find their food. I can only laugh when I hear that. There are numerous methods to make sure that your gecko find its food, but buying a tiny Leopard gecko terrarium should be none of them. I recommend to get at least a 15 Gallon tank. I know that most people get an aquarium and use it as a terrarium. You can do that, but than you have to grab your gecko from above when you want to get it out of the tank. Please keep in mind that Leopard geckos natural enemys are eagles and hawks, which attack from above. So it can get stressed if you grab it from above. That´s why I get a Leopard gecko cage with doors. This way I reduce stress and I do not have to take of the lighting setup and the screencover when I want to handle my gecko, which I would have to do, if I would have an aquarium. On the right you can see the tank I recommend. It is a little bit more expensive, but definitely worth the price, since there is a screencover, a background and a integrated air circulation system included. I do not recommend those plastic boxes, which you can see all over Youtube as a cage for a Leopard gecko. A reptile is a living being and not some old pair of shoes that you stuff into a box with other stuff you do not need at the moment. Oh man, back in the day, when I started with reptiles, lighting drove me crazy. It was really confusing. because I just wanted to know which bulb I should exactly buy to reach the right temperature and all that, but instead I just found posts inforums on the internet where people discussed which bulbs have a stronger UVB output. You most probably know that problem. Don´t worry, when it comes to lighting, Leopard geckos are pretty unchallenging. If you get a 20 Gallon tank, a 60W to 75W heating bulb is all you need for a basic setup. Of course you also need a fixture for that bulb which you can place on the screencover. With the bulb and the fixture on the right, you are good to go. If you need a little bit more information about lighting for your Leos, have a look at my Lighting guide. I explain everything you need to know there, including what the right temperature is and why Leopard geckos do not really need a UVB bulb. Substrate is a very important topic. Most people use kitchen roll, reptile carpet, or newspaper for their Leopard gecko cage setup. The reason for that is that especially baby Leopard geckos easily get impacted when they accidentally eat some of the substrate while they are hunting their food. Sand is most probably one of the most common causes of death of Leopard geckos kept as pets. While I absolutely agree that Sand is the worst substrates for Leos (and for a lot of other reptiles, too), I do not think that kitchen roll, newspaper, or reptile carpet is the best standard substrate for a Leopard gecko enclosure. When Should You Use Reptile Carpet Or Kitchen Roll? I would use kitchen roll or repti carpet only if your Leopard gecko is still a little baby. There is no risk of impaction and besides that it is easier to clean for the first couple of months, since Leopard geckos poo a lot when they are babys, because they eat soooo much in the beginning. Further I would need that as a substrate for quarantine tanks. ​Okay, so here is the substrate which I think is the best for a lot of reptiles. I do not only use it for my Leopard geckos. I have a lot of reptiles and I also use it for my Bearded dragons for example. This clay gets hard after it dried out. That means that there is no risk that your reptile might eat some of the substrate and get impacted. Further you can form caves and hills with this clay. This way you can create an awesome looking natural Leopard gecko habitat. You can also put plastic plants or any other good looking stuff in the clay before it dries out. The clay is not expensive at all and you can also get a Cavern Kit which helps you to form caves and hills, however, of course, you do not really need that. If you need more information abou substrate for Leopard geckos, have a look at my Substrate Guide. You definitely need at least two hides for your Leopard geckos. One should be more warm and dry and the other hide should be moist and in the cooler zone so that your pet always have the possibility to cool down a bit. As I said, you can form hides for your reptile with the substrate I recommend above. However if you do not have any hides, you should get a cheap hide, for example the one on the right. The moist hide in the cooler zone is a little bit different and I wrote a little guide on how to create that here: Moist Hide For A Leo. The article opens in a new window tab, so you can continue reading here as well. With the setup above you are actually ready for a Leopard gecko. However you should add some branches or plants to this habitat. I always emphasize that it is very important to create a natural habitat for a reptile. We keep them in captivity, so I think it is our job to create a good environment for our reptiles. So go and get some branches and other stuff, so that your gecko has some more hiding places. and you have to have real plants, since plastic plants dry very quickly. So I think the easiest way to make sure that your Leo is always hydrated is to get a water dish. A food dish is not necessary, by the way. Many people who get a Leopard gecko want a second, third or fourth gecko after a short while and that´s totally understandable, since Leos are so cute and actually pretty easy to take care of, because they are hardy. Housing two Leopard geckos or even more requires a bigger tank. However the tank should not be too big. Why? Leopard geckos are territorial in the wild. In captivity they do not show territorial behavior, because they do not have enough space for that. However if you give them a really big tank, they will start to show their territorial behavior. So because of that, you should not get a tank that is too big when you get a second gecko. I suggest a 30 Gallon tank for that. OR stick to the 20-Gallon tank above at first if you have one of the smaller breeds. ​I really hope that this Leopard Gecko Housing Guide helped you. I use this setup for a very long time now and I can tell you that I never had any problems with it. Besides that, this is a relatively cheap Leopard gecko setup If you need more information or if you have additional questions, just leave me a comment in the comment section below. I always answer and help my readers, so do not hesitate to contact me. The fact that you are doing your research right now shows that you most probably will be a great reptile owner, since most people just buy a reptile and ask questions later. 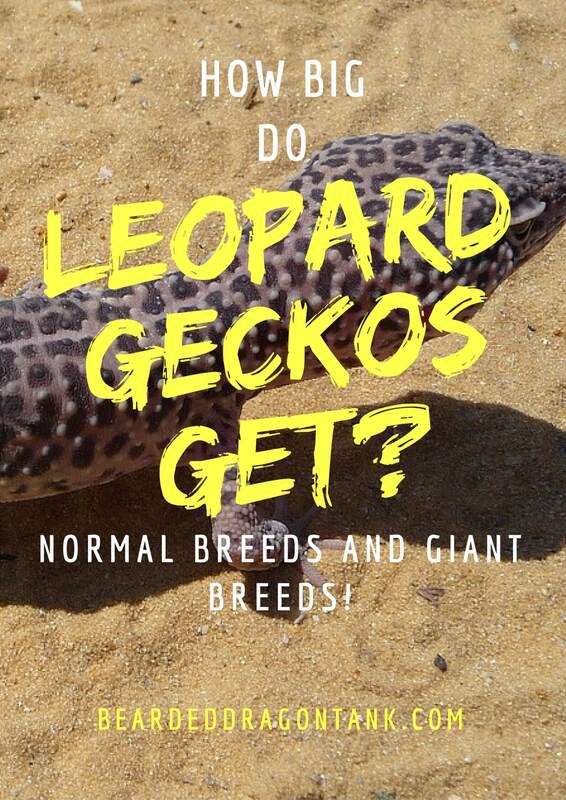 If you are reading this article you might want to know how big Leopard geckos get and you probably need some general information about Leopard gecko size. The size of the reptile determines how much money you need to spend for a good habitat, what kind of food you need, how big the tank has to be and so on and so forth. How Big Does A Leopard Gecko Get? That depends on if you have a male or a female Leopard gecko. Male Leopard geckos normally are a little bit larger than females. The size varies, some geckos only reach 6-7 inches, others can even reach 10 to 11 inches. There are giant breeds that most of the time reaches 10 to 11 inches and they even can weigh 140 grams. The biggest Leopard gecko I´ve heard of weighted around 155 grams. However the normal Leopard gecko weight is around 70 grams. It really depends on your taste. If you want to get a big Leopard gecko, there are some breeds which are guaranteed big boys and girls. If you want to get a smaller one, they are cute as well and feeding costs are probably a little bit lower then. Further the price of those giant breeds can be really, really high. For example, the Temper Giant Breed can cost up to over $900 bucks. The price for a normal Leopard gecko is around $30. That´s quite a difference, right? Leopard gecko hatchlings are very cute and they are so, so small. Normally a hatchlings is around 2 to 3 inches and it only weighs around 4 grams. It takes around 1 year for a Leopard gecko to reach it´s full size. However your Leopard gecko will continue to grow till it dies, as all reptiles do. That is the reason why they shed on a regular base. It is really important for every reptile that it lives in a natural habitat with a good size. If you get a tank that is too small, your Leopard gecko might start to show some weird behaviors. It might lose it´s appetite, or bumbs against objects with it´s snout the whole day. Most people do not realise that reptiles really can suffer from psychological problems and the wrong tank size could be a reason for that. Further your tank should be a glass tank. Aquariums are used very often and they are okay. However I like to use reptile tanks with doors, so that I do not have to grab my gecko from above when I want to get it out of it´s tank. In the wild eagles and hawks hunt Leopard geckos and grab them from above. It could mean unwanted stress for your gecko if you grab it from above. If you asked yourself “How big do Leopard Geckos get”, I think that this articles answered your question. Now it is up to you to decide if you want to get a bigger Leopard Gecko or a normal one. All of them are great and always remember your baby will be a full grown Leopard Gecko in around one year. Get a good tank for it and have fun with it! How big is your Leopard gecko? Let´s talk about it in the comment section below. If you have any questions you can also leave me your question in the comment section below… I will get back to you, I promise! Author beardeddragontankPosted on November 25, 2016 Leave a comment on A Full Grown Leopard Gecko? How Big Do Leopard Geckos Get? If you are visiting this website because you want to know what the best Leopard gecko substrate is, you came to the right place! It is awesome that you are doing your research and you will definitely get the right information here on substrate for leopard geckos. 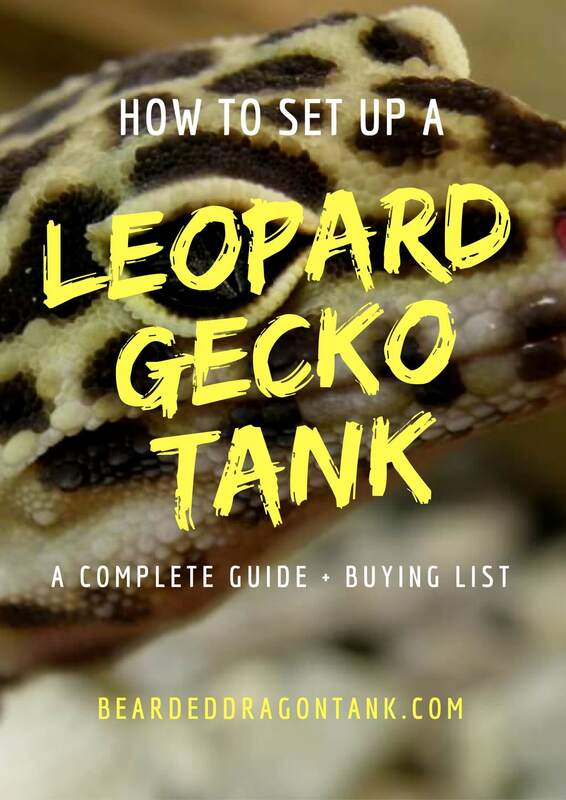 In this article I will not only give you information on substrate for Leopard geckos, I will also tell you exactly which products you should use to create the best bedding for Leopard geckos. So what I do is, instead of using just loose sand as a substrate I mix it with clay. This way the substrate will be more compact and there is no risk that your Leopard gecko is going to eat it, because the substrate gets becomes solid after a while. However there is no need to mix this clay with sand, you can also just use they clay. It will be more solid then. If you want a little bit more of a soft substrate, where your Leopard gecko is able to digg, you should mix it with sand. Please just do not use too much sand. You can find the clay I am talking about on the right. I recommend to get 4-6 of these bags to fill your tank with a good amount of substrate. 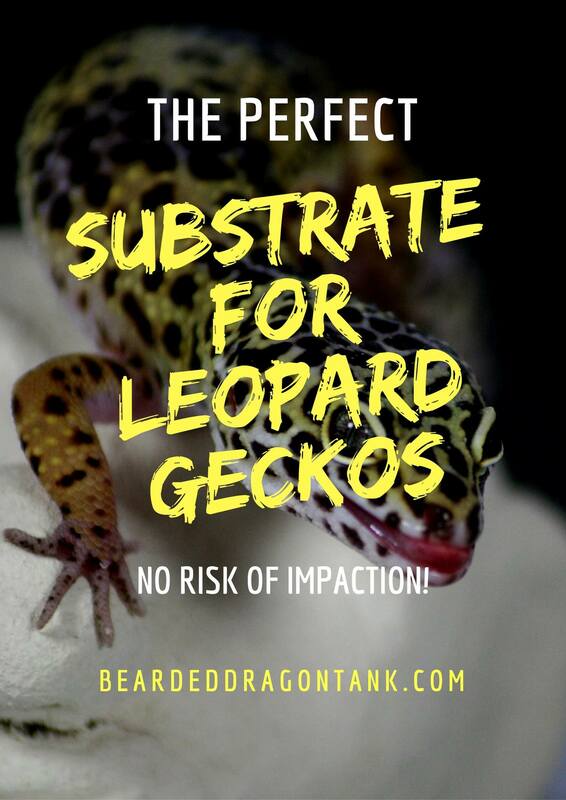 I already told you that there is no risk, that your Leopard gecko might eat this substrate, but there is also another awesome thing about this substrate. You can form caves with it. I use this substrate for a long time now and I also use it for my bearded dragons. It is simply amazing how easy it is to create some cool caves or holes for your reptiles. Leopard geckos need hides anyway and with this substrate you can let it look naturally. There is a Cavern Kit for this substrate that you can get, which makes it easier to form those caves.However you do not really need it. Just use a mini shovel, or your hands and be creative. Maybe use some balloons and pop them as soon as the clay is dry to create some awesome caves.​ In my opinion this is the best Leopard gecko substrate. Another thing that you often times hear in pet shops: Use calcium sand, it is good for your reptile! – NO, it is not! While your Leopard gecko needs calcium, it should not get it from eating sand. Leopard geckos are not able to digest calcium sand, since it is just a normal sand mixed with calcium. So it will eventually kill your reptile if you use it. So what do we have learned from this article? Simply have a look at the natural environment of your reptile and try to copy that as best as possible. This way you will never have any problems with your reptile. Properly caring for a savannah monitor requires you to replicate the lizards’ natural habitat in several different ways. 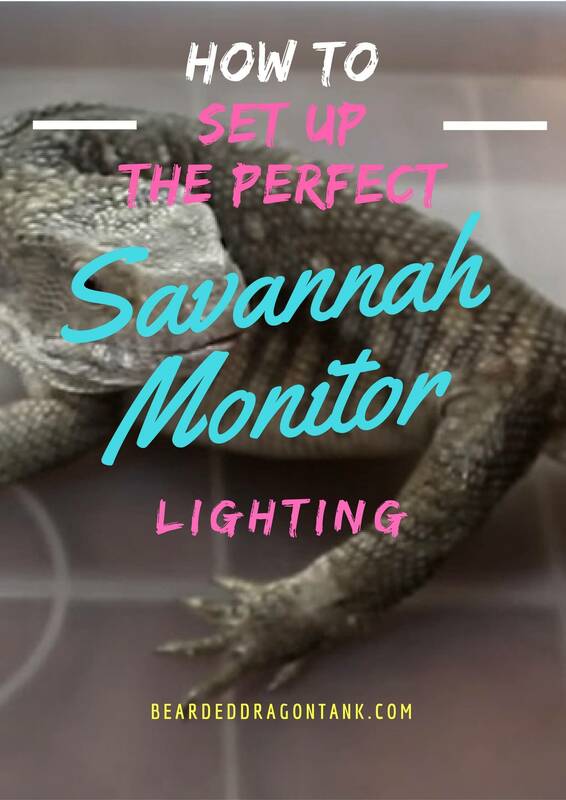 Most fledgling keepers understand that this will require you to monitor things like temperature and humidity levels, but many fail to realize that it is also important to replicate the type of lighting savannah monitors experience in the wild. This includes not only providing light of sufficient intensity (brightness), but you must also provide light comprised of the appropriate wavelengths. You can accomplish this by using the right type of light fixtures and light bulbs, as well as placing them in the correct locations. In this article I will not only give you information on the right lighting for your monitor, I will also show you the exact set up you need for a natural savannah monitor habitat. Providing the right type of bosc monitor lighting requires that you address two things: The light intensity and the light’s spectrum. Measuring the amount of light intensity you are providing your lizard is difficult for hobbyists, and for the most part, unnecessary. Instead, it is simply wise to illuminate the habitat as brightly as is possible. You can never compete with the sun by using light bulbs, so just do your best to bathe the habitat in as much light as is possible. However, you must be sure that your pet still has access to dark areas in the cage, such as burrows. Without sufficiently bright lighting, your lizard is likely to languish rather than thrive. In addition to bright lighting, you must be sure that the light contains the correct wavelengths of light. This primarily relates to the amount of UVA and UVB produced by a given light bulb. Savannah monitor lighting requirements demand the presence of both UVA and UVB wavelengths, so be sure to select a bulb that provides such. Often, light containing both UVA and UVB (no lights available for commercial use produce UVC, as it is quite dangerous), are labelled as “full spectrum” lights. The most common way to provide full-spectrum lighting to your savannah monitor is through the use of fluorescent bulbs and ballasts. Be sure to check the product packaging to ensure that the bulb produces both UVA and UVB. Note that fluorescent bulbs do not produce much heat – you will need a separate set of heat lamps or radiant heat panels to provide your pet with the proper thermal environment. BTW: The temperature under the basking spot should be between 105 and 110 degrees. The rest of the cage should be around 90 degrees or slightly higher. Do not worry about the temperature at night. It is known that it has no effect on savannah monitors when it is a little bit colder at night. There is one type of bulb – a mercury vapor bulb – that can produce both heat and ultraviolet light, but these are often tricky to use safely, given their tendency to produce an incredible amount of heat. Accordingly, they are inappropriate for beginners. There are some self-ballasted (compact) fluorescent bulbs on the market that are capable of producing UV light, but the bulk of the products available are manufactured as linear fluorescent bulbs that require a dedicated ballast. In addition to the bulbs and ballasts, you may want to invest in a lamp timer to automate the on-off process. Additionally, by doing so, you’ll keep your pet’s day-night cycle consistent. Be sure to provide your lizard with a balanced photoperiod, consisting of 12 hours of daylight (when the lights are on) and 12 hours of nighttime (when the lights are off). So here is how your setup should look: UVB, Heat plus fixtures for both bulbs and you should get a thermometer as well to make sure that you reach the right temperature for your savannah monitor. With the setup below you are absolutely ready to go. It is important to understand that your bosc monitor will absorb the highest levels of UVA and UVB while basking. Therefore, it is wise to place the full-spectrum lights adjacent to the lamps that provide heat to your lizard. Be careful that you do not place the ballasts too close to the heat lamps, or they may melt or suffer other types of damage. It is important that the full-spectrum lights are not placed too far away from the lizard. Many products are designed to be installed no more than 12 inches above the basking spot, while others are designed to sit 18 inches above the basking spot. Check the specific recommendations from the manufacturer to ensure your lizard is receiving adequate, yet not dangerous levels of UV light. Further make sure that you place these light on a screencover, not on a glass cover. Unfortunately, many new keepers are unaware that their bosc monitor’s lighting needs are so stringent. Rather than providing them with a brightly lit enclosure, bathed in the proper ratio of wavelengths, many keepers maintain their lizards in dimly lit habitats, without access to UVA or UVB wavelengths. Providing inappropriate savannah monitor lighting can cause the lizards to become lethargic and spend long periods of time in their hiding box, rather than exploring their cage and obtaining exercise. Some lizards may even develop metabolic problems when deprived of ultraviolet radiation, which may ultimately lead to their death. To avoid these and other health problems, be sure to give your savannah monitor the lighting he requires. Substrate selection is not a terribly important consideration for many reptiles, such as arboreal geckos or snakes. They only rarely come into contact with their bedding and do not burrow or dig as a matter of practice. The same cannot be said of savannah monitors, who spend the bulk of their lives in direct contact with their substrate. Additionally, as the reptilian equivalents of badgers, savannah monitors spend long periods of time digging into the substrate. Accordingly, the best substrate for savannah monitors is one that is safe, replicates the substrate of their natural habitat and allows them to dig stable tunnels. Unfortunately, there are no widely available commercial products that fit this description. 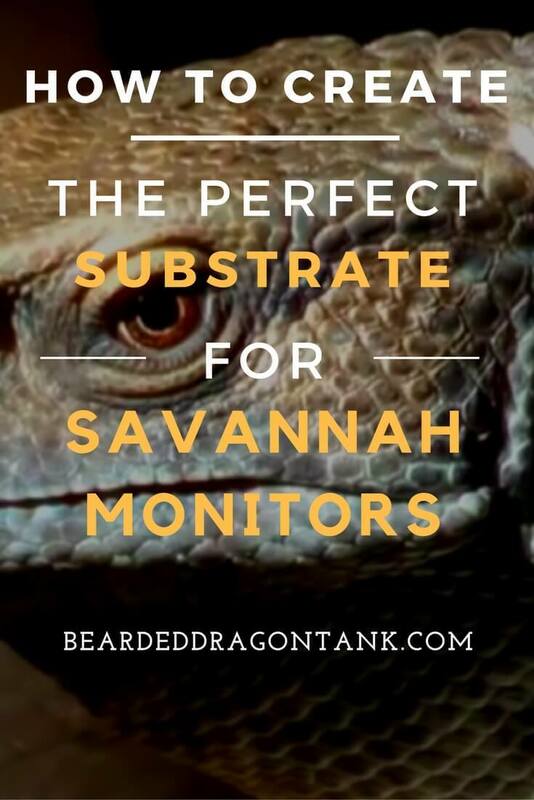 You will have to make your own custom substrate blend for savannah monitor maintenance. Sands marketed for use with reptiles are available – and they can be used as a component in your custom blend – but they are not suitable on their own. Similarly, bark and mulch products for reptiles can be used in a custom blend, but they should not be used by themselves. Ideally, you should use a combination of sand, clay – and to a smaller extent mulch or bark chips – to create an ideal savannah monitor substrate. However, it is impossible to provide a blanket formula for a proper mix, as the sands and clays available to keepers vary widely. You will need to experiment with different ratios to arrive at the perfect mix. I recommend you to get maybe a little bit more than needed of the three following products to create the perfect substrate. I will show you below how you know when the substrate has the right consistency and what you also should know about substrate. Many new keepers fail to take substrate safety into consideration, and allow their lizards to become sick or injured – some savannah monitors surely die from exposure to unsafe substrates. Characteristics that make a substrate unsafe are varied, but the primary thing to watch out for is substrates containing things that produce toxic fumes. Toxic fumes are primarily a concern for substrates that include the wood of cedar trees. Cedar wood is naturally insecticidal (hence its use as a closet wood – it repels clothes-eating moths), and the fumes released from the wood have been implicated in the deaths of countless reptiles. Accordingly, you must always be sure that any substrate you purchase or make contains no cedar-derived products. Keepers are also wise to avoid eucalyptus or pine based products, as these trees also produce aromatic compounds. Savannah monitors – like their name suggests – live in savannahs and open woodlands. Most of their natural habitat features hardened clay-heavy soil, covered with a thin layer of sand, dust and organic debris. This means that sand-based substrates are more natural for your pet, but there is an additional benefit as well. In most open habitats, the substrate is rather dry, which results in a low humidity level. However, in other locations, such as a small clump of trees, the shelter will serve to keep the sand damper, thus providing a higher local humidity level. Savannah monitors rely on these humidity gradients in the wild to maintain proper hydration levels. You can accomplish the same thing by using sand-based substrates in your pet’s cage. Sand and clay-based substrates can be moistened to varying levels – this provides a range of humidity levels for your lizard, which provides a number of health benefits. The most difficult aspect of providing your lizard with the best substrate is enabling the construction of stable tunnels. Bosc monitors use these tunnels as hiding places, but they also enable the lizards to thermoregulate. Most particulate substrates will not retain a tunnel once your lizard starts digging. You lizard may still choose to remain underneath the substrate, but he will not be able to use it as he would in the wild. The best way to work around this is by adding enough clay and water to the sand to allow the substrate to retain its shape. As a rule-of-thumb, you must be able to compress the mixture into a small ball in your hand if it is to work well enough for tunnel construction. Savannah monitors are often enjoyable monitors to maintain, and their husbandry requirements are relatively easy to provide. The greatest challenge you will likely face is blending your own substrate. Just remember to use safe materials, strive to make the substrate as similar to the substrate they encounter in the wild and be sure that the substrate will allow the construction of tunnels. You may need to adjust the mixture several times at the outset, but once you arrive at the proper mixture, your lizard is sure to appreciate your efforts. Once you see your bosc monitor climbing down a freshly excavated, stable burrow, you’ll know the ratio is correct. Savannah Monitors can get quite big. However how big do they really get and does every animal become huge? The truth about the savannah monitor size! Further I show you what you can do if you want to own a savannah monitor, but it is too big for your taste. Monitor lizards are famous for being impressively large in size. The Komodo dragon which is one of the well-known monitor lizards can be up to 10ft long. The Savannah monitor, or also called Bosc monitor (Varanus exanthematicus), is also one of the monitor lizards. Like the name suggests, the Savannah lizard is found in the savannahs and grasslands of central Africa. They are slowly becoming more and more of many people favorite’s lizard pets. Unlike their Kodomo cousin, they are only a medium-sized monitor species. However, even if it is a medium size lizard, a Bosc monitor when full grown can get quite big. And for an indoor pet, the savannah monitor size does concern many potential owners. So how big do Savannah monitors get actually? How big are the hatchlings? And how big are full grown savannah monitors? This article will help you discover the truth. Like any other pets, lizards come in its own type of diversity: in color, in species, in looks and in size. And as the pet can reflect its owner personality and choices, what species of lizard you choose will totally base on your preference and living condition. As said earlier, a monitor lizard can get quite big and if you are looking for a gigantic, monster-like sized lizard, a full grown Savannah monitor can get close but it might not really be what you are looking for. In general, a Savannah monitor is only medium-size and I have to say, pretty reasonably size as well. Bosc monitor’s size makes it a good choice for beginners who prefer bigger lizards but are not experienced enough or not willing to house a truly giant one. Savannah monitors are stoutly built. Their limbs and toes are relatively short so a Bosc monitor lizard is not ‘big’ overall but mostly ‘long’ in body size. So it is still not difficult to house one regardless of your own living condition. 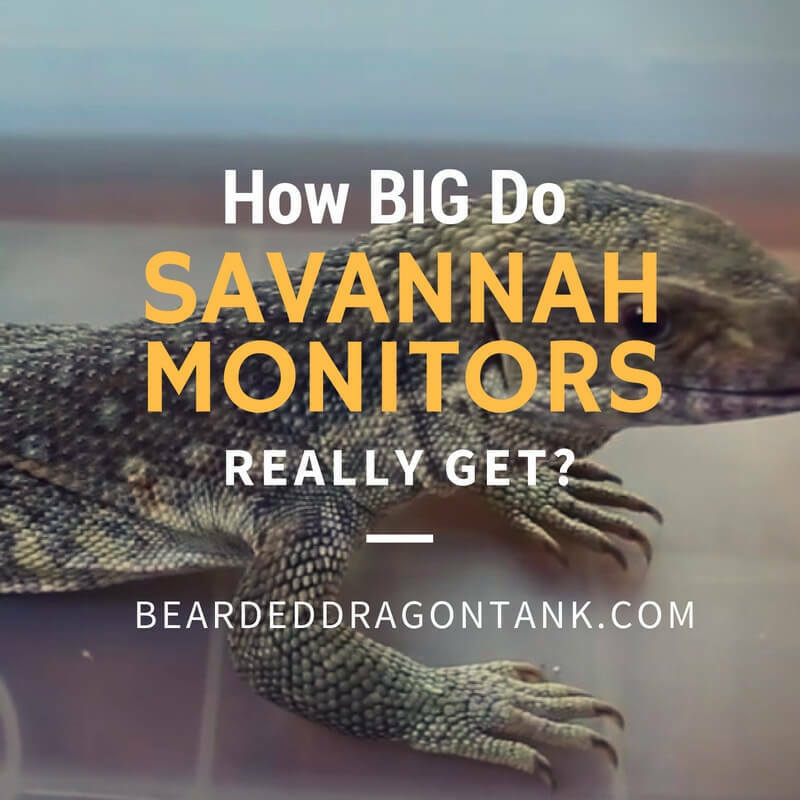 How big do savannah monitors get? Ok, let’s get to the main question that takes you to this post in the first place: how big does a savannah monitor get? Bosc monitor hatchlings are very similar in size compared to all other lizard species. They are only a few inches long when they hatch. However, they grow very rapidly. Other lizard species grow much slower and take about 4 to 5 years on average to be fully grown. Savannah monitors can reach full maturity in as little as 2 years, though it is more common for them to take 3 to 4 years to grow to full size. So if you are looking forward to having big lizards and you receive a tiny hatchling, don’t worry, they will grow in a blink. Savannah monitors can get pretty big, but nowhere near as big as their Kodomo cousin. A Bosc monitor when full grown, can range in size from 2.5 to 3.5 feet in total length. Sometimes, on occasions, there are specimens that are wildly different in size than the average. In these occasions, a full grown savannah monitor can grow as long as 5 feet. Even though that is not often the case, when owning a Bosc monitor, you need to be prepared for even when they grow that big. This preparation is especially important when it comes to the tank size. Think ahead when building a habitat for your lizard. Female savannah monitors – The better option for beginners? Or if you don’t really want to have to worry that far, you can go with a safer option by choosing a female monitor. In the wild, females monitors are considerably much smaller. On average, female savannah monitors’ size ranges from only 2 to 2.5 feet, which is more than a foot shorter compared to the males. The biggest a female savannah monitor can get is about 4 feet. If you want a smaller size savannah lizards for sure, opting for a female is a safer bet. Pets reflect their owners’ personalities and preferences. Like how there are people who prefer Great Dane and Husky over the little Chihuahua dogs. Some lizard owners want small, colorful lizards, and some want bigger ones. A savannah lizard can be big, but to be honest, they are not that big and pretty reasonably size. So if you are one of those that actually prefer cool, gigantic looking lizards but do not want to go too far over the top, a Savannah monitor is a good choice for you. With proper care, a savannah monitor can live up to 10 years. So choose carefully since it is a long and meaningful commitment you are about to make.